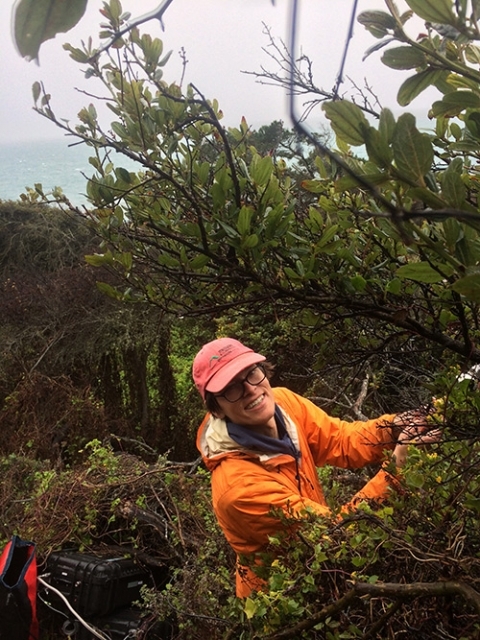 As scientists deploy their instruments at research sites throughout the UC Natural Reserve System, networked cameras will monitor changes in the vegetation, snapping photos every half hour, while lasers track carbon flow in coastal redwood forests and environmental sensors monitor the microclimates experienced by plants and animals in different habitats. Researchers are also working to reconstruct historical climate variation and changes in land use patterns, assessing the effects of reduced rainfall, and studying the linkages between land and sea along the California coast. All of these projects are coordinated by the UC-wide Institute for the Study of Ecological and Evolutionary Climate Impacts (ISEECI). "Having a whole network of UC scientists working together allows us to accomplish a lot more than we could individually. And as a resource for climate change studies, the Natural Reserve System is a jewel," said ISEECI director Barry Sinervo, professor of ecology and evolutionary biology at UC Santa Cruz. The overall goal is to provide an integrated understanding of how ecosystems respond to climate change across broad geographic scales, allowing scientists to identify California's greatest vulnerabilities and find opportunities to lessen the impacts. "Climate change is the big global issue of our time. I don't see the impacts on nature as separate from the human impacts, because we depend on natural ecosystems in so many ways," said ISEECI codirector Laurel Fox, professor of ecology and evolutionary biology at UC Santa Cruz. "Taking a statewide approach to studying climate change will give us the information we need to start thinking about how to deal with climate change and how to identify solutions and adaptations." ISEECI was established in 2014 with the support of a $1.9 million grant from the UC President's Research Catalyst Awards program. By bringing together scientists from different campuses, ISEECI has catalyzed new collaborations that have won additional funding from agencies such as the National Science Foundation (NSF). A major new NSF grant, for example, is funding research on the interactions between fog, climate change, and redwood forests. Led by Elliott Campbell at UC Merced, the multi-campus, $1.75 million project will provide crucial data supporting the broader goals of ISEECI, Sinervo said. "These ideas grew out of our first meeting, and Elliott's project is a major cornerstone in our plans for ISEECI," he said. Fog is an important source of summer moisture for coastal redwood forests, but it also interferes with standard methods for studying carbon flow in forests.The fog itself obscures analysis of the amount of moisture leaves breathe out, or transpire. To dodge this problem, a team led by Campbell and Todd Dawson of UC Berkeley will use high-tech laser spectrometers to measure atmospheric levels of another chemical, carbonyl sulfide. This chemical can serve as a tracer to measure rates of photosynthesis and tree moisture loss. The data will inform simulations of coast redwood physiology under current and forecast fog patterns. Research by Sinervo and others on the animals that live in redwood forests will build on the findings from Campbell's project. "We have just begun instrumenting the Big Creek Reserve with ecophysiological sensors and a long-term monitoring program to piggy-back off of the inferences that Elliott and his collaboration find regarding redwoods under climate change," Sinervo said. 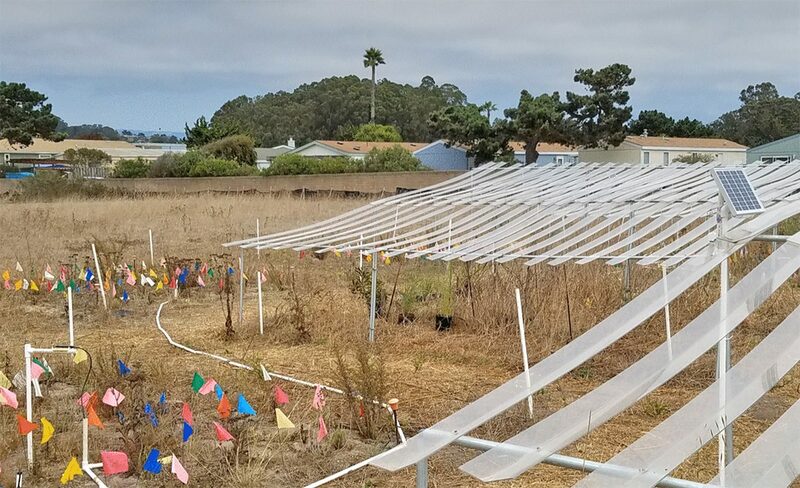 The sensor network being deployed at Landels-Hill Big Creek and 11 other reserves is funded by another NSF grant, led by Sinervo and Fox at UCSC and Susan Mazer at UC Santa Barbara. Their collaboration extends beyond the UC reserves to include scientists at the University of Northern Arizona's Southwest Experimental Garden Array (SEGA). "SEGA is addressing a similar set of questions, and this collaboration enables us to compare regions across California and into Arizona for patterns related to climate change," said Fox, who is currently leading a major grant proposal for an even larger project that would also involve SEGA. Meanwhile, an ongoing project under the ISEECI umbrella is looking at the effects of reduced precipitation in different ecosystems using a standardized protocol for excluding rain and snow from study sites. 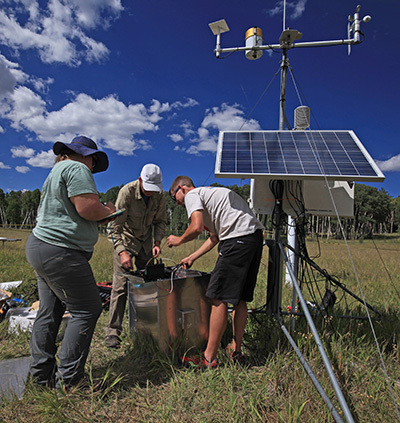 Led by Michael Loik, associate professor of environmental studies at UCSC, the NRS study sites are part of a larger international network of sites, called Drought Net, designed to assess the sensitivity of global ecosystems to drought. The NRS's Younger Lagoon Reserve is one of Loik's NRS Drought Net study sites. ISEECI now involves about 130 affiliated faculty across all 9 UC undergraduate campuses, and is funding five postdoctoral fellows and about 30 graduate students throughout the UC system. The effort includes a broad range of projects addressing different aspects of the climate change problem. "We have big plans that go well beyond the scope of what we're currently funded for, so we're always looking for new sources of funding," Fox said. "My hope is to have additional funding in place to continue this work beyond the four years of the initial grant."